(CN) – California’s iconic Wine Country has been ravaged by wildfires since late Sunday, two of nearly 20 fires raging across the Golden State that have so far left at least 15 people dead, thousands of homes destroyed and scores of firefighters battling to contain the damage. Gov. Jerry Brown issued an emergency proclamation for Napa, Sonoma and Yuba counties due to fires and asked President Donald Trump to issue a major disaster declaration for the counties that have been beset by several separate fires. Brown has also issued a similar emergency proclamation for five other counties – Lake, Mendocino, Nevada, Orange and Butte. Already in California for GOP fundraising, Vice President Mike Pence visited the state’s emergency management office Tuesday and said Trump had approved a major disaster declaration. There are at least 17 large fires blazing throughout northern California. Nine of the deaths reported Monday occurred in Napa and Sonoma Counties. A woman died in the Cascade Fire burning in Yuba County when her car veered off a rural road as she attempted to flee, according to Yuba County Spokesman Russ Brown. One person was killed and two others were severely injured in Mendocino County’s Redwood Complex Fire – created when the Redwood Fire and the Potter Fire merged – which was driven west by high winds, Berlant said. 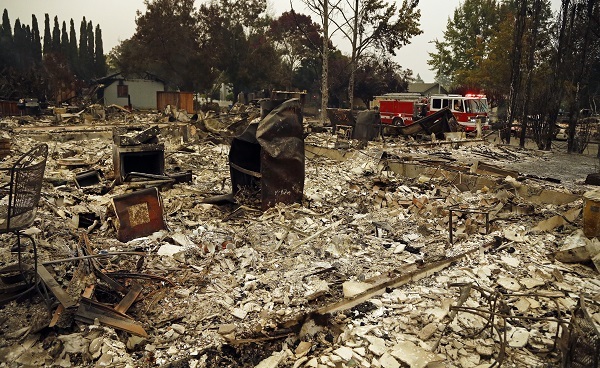 Sonoma County has seen most of the damage, as the Tubbs Fire swept through a populated area of Santa Rosa and completely destroyed vast swathes of the city. At least nine of the fatalities reported so far occurred in Sonoma County. Santa Rosa, population 175,000, is Wine Country’s largest city and lies about 60 miles north of San Francisco. The Tubbs Fire has burned 27,000 acres across Sonoma County with zero containment. The area’s other large fire, the Atlas Fire, has burned 25,000 acres in Napa County, killed four people and is also at zero containment, Berlant said. Officials are worried the death toll could mount, with hundreds of missing persons reports filed in affected counties, though they said those currently missing are likely to be located and safe. Firefighters appear to be getting a handle on some of Northern California’s smaller fires, like the Cherokee Fire in Butte County which is 40 percent contained as of Tuesday morning. Cooler temperatures, higher humidity and less wind have all helped the containment effort. More than 20,000 people have been evacuated from across Northern California, according to Cal Fire, with more evacuations expected throughout the day. All told, the fires have burned 120,000 acres and destroyed more than 2,000 homes, businesses and other structures, making the incident one of the worst firestorms in California history. September and October mark the peak of California’s wildfire season, with the state at its driest. Conditions typically ease after the first big rainfall, which takes place usually in late October or early November. The wildfire problem is often compounded by high winds that pummel the state in the fall, as happened on Monday. Sonoma County, home to picturesque landscapes and producers of some of the most well-known wines in the world, saw the brunt of the firestorm. 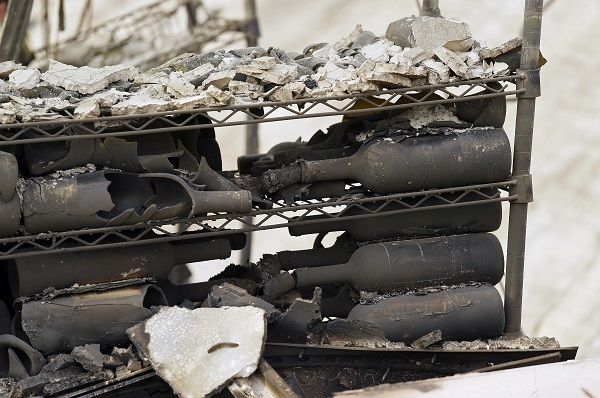 The fires devastated several of the classic wineries that dot the region, including Signorello and William Hill.